Home > Items just added 4/3-4/17 > Rare 1970's Vintage Belt Buckle. Hands Rolling a Doobie! Marijuana Leaf! RARE AND COLLECTIBLE 1970's Vintage Belt Buckle. 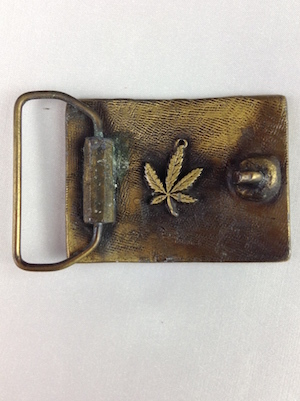 Insanely cool rectangular belt buckle with two hands rolling a joint! Below the hands is a small pot leaf. Buckle is done in a brass colored finish with a textured background and smooth edges. 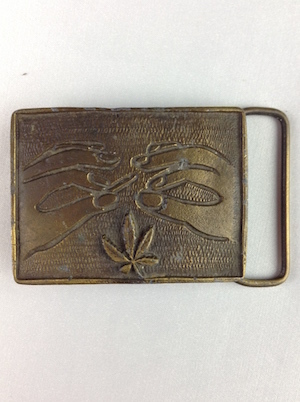 The back of the buckle features another pot leaf. Condition: Good++ Has some patina spots and some wear. Still a super cool vintage belt buckle! Priced accordingly. Measures: Roughly 2.5" x 2"